Green Timbers Lake is one of several urban lakes in the Greater Vancouver Regional District where trout fishing can be done year-round. Because it is nested in a suburban area, Green Timbers Lake can be quite regularly used. Nevertheless, the fishing experience can be very enjoyable due to its forested setting. Green Timbers Lake is located at Green Timbers Urban Forest Park in Surrey (Fraser Highway and 96th Avenue). Access to the lake is from the parking lot at the north side of the park along 100th Avenue. The walk from the parking lot to the lake is around five minutes. Except mid winter when freezing is possible, Green Timbers Lake is fishable almost year-round. It is stocked with rainbow trout by the Fraser Valley Trout Hatchery from March to June and from October to early December. Fishing is best during spring, fall and summer evenings. Green Timbers is a very small lake, so fishing can only be done from shore. The east side of the lake is quite open, so flyfishing can be done as long as you are aware of walkers who may pass by behind you at times. The northern and southern ends are the deepest portions of the lake, where fishing is best. Bait fishing with a float or bottom rig is the easiest method to catch these rainbow trout. A rod holder or stand can be very useful as there are not many shore structures to hold your rod up. Bait such as deli shrimp, dew or garden worm, single eggs, corn or scented artificial bait will all produce. Spincasting with small metallic lures will also work, but this can be quite difficult if there are many anglers fishing nearby. The average weight of most stocked rainbow trout is 250 grams, but occasionally the Fraser Valley Trout Hatchery will release larger trout that weigh up to 8lb into the lake. These fish are usually used as broodstocks at the hatchery so their eating quality is not great, but they can certainly be exciting at the end of your fishing line. 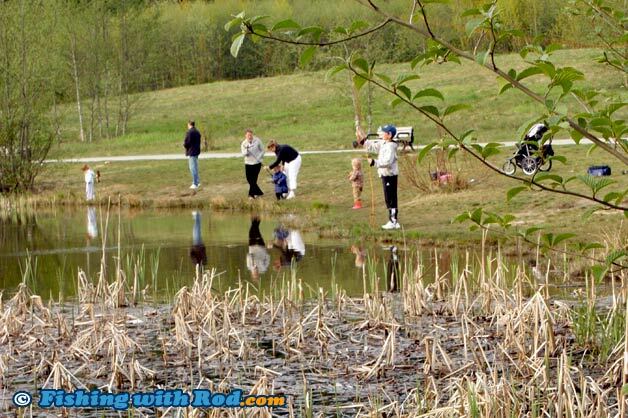 Green Timbers Lake is located in Region 2 in the British Columbia freshwater fishing regulations. This lake also has its own localized regulations too, so be sure to read about them when arriving at the lake. Green Timbers Lake is located in an urban park, where many other users can be found. Please respect other users when using the area. Keeping the noise level down and picking up your own garbage makes everyone's experience enjoyable.